Last winter the magazine Entertainment Weekly did a story about me in which I was called "the angriest man in television." When the article came out I shrugged and said things like, "Oh, it's just a trashy tabloid, it doesn't mean anything." But you know what? That's a lot of crap. It's taken me ten months to get in touch with my feelings about that article (pretty quick for a guy), and guess what? I'm angry! How dare anyone suggest I have no right to feel what I feel? If you're even barely engaged in this world, anger manifests itself constantly (assuming you're not medicated, which I am not, dammit to hell!). And let's be totally honest here, anger does a lot of good. It clenches my stomach muscles into a tight knot so I can look good with my shirt tucked in. It adds hours and hours of productivity by keeping me awake until five o'clock in the morning. It's a constant reminder that I should never own a gun. It makes golf an opportunity to practice my javelin toss. It fills me with joy every time Lewis Black is on The Daily Show. It adds sizzle to caffeine. It whispers to me that I'm fine, that I don't need to slow down, and that my cardiologist is an idiot. It keeps people at a healthy distance during flu season (and the rest of the year as well). 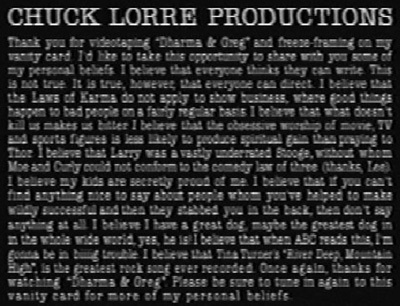 And finally, it encourages me to use my vanity card to foolishly burn bridges with TV critics. Hey EW! Do not screw with me. I've got two vanity cards now, and I'm not afraid to use 'em! Okay, the sun's coming up, I'm gonna try and get some sleep.